Firefox 8 is the next version of Mozilla Firefox web browser. Mozilla team built several PPAs for current and future Firefox versions. The stable PPA contains current version of Firefox(current is firefox 7) and supports old versions of Ubuntu. Normally, the latest Ubuntu release auto-upgrade Firefox to the latest stable version. 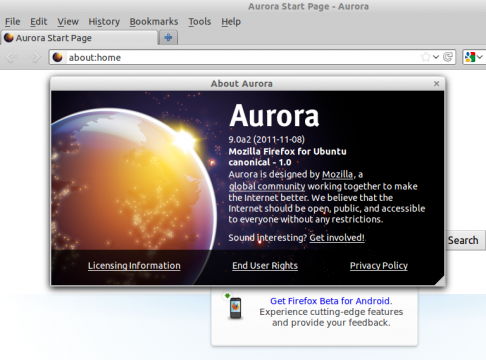 The next PPA contains releases of Firefox from the beta channel. Now, we can get Firefox 8 from this ppa, but it will remove previous installed verison. 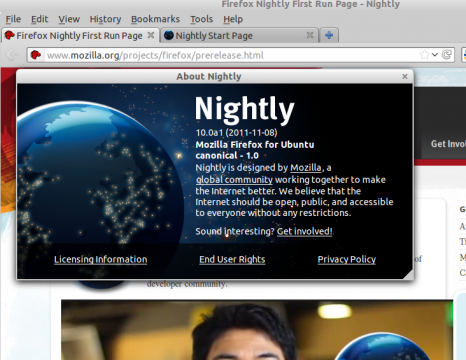 When Firefox 8 become stable, it should be moved into stable ppa and I think it will be default in next Ubuntu version. The Firefox Aurora PPA contains builds of Firefox from the aurora channel, currently it is firefox 9. If you want to try it, you can add this ppa. But it will remove previous installed Firefox version. The Daily build PPA contains packages for both Firefox and Thunderbird. Currently, they’re Firefox 11.0 alpha1 and Thunderbird 11.0 alhpa1(The package named 11.0, but it’s 10.0 in my installed about page). It’s an independent installation, it won’t remove previous installed Firefox verion. 1 user responded in " Install Firefox 8 and Future Versions in Ubuntu 11.10/11.04/10.10/10.04 "
Firefox 8 has been out for some time, you’re not quite up-to-date.